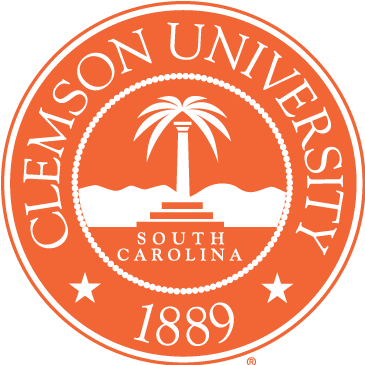 Clemson University is a public institution located in Clemson, South Carolina. The beautiful campus set on 17,000 acres is home to just under 18,000 full time undergraduate students. Despite the large size, the central part of campus is easily walkable, and the town is one mile away, well known as a friendly college town with restaurants, bars, and shops serving students and their families. Sports are a big part of life at Clemson; fans bleed orange for their beloved Tigers. While approximately 60 percent of the students are from South Carolina, in the last few years Clemson has seen a healthy uptick in popularity from students across the U.S.
Transportation: Greenville-Spartanburg Airport is the nearest international airport, 45 miles from campus. Other regional airports include Charlotte Douglas International Airport in Charlotte, N.C., and Hartsfield-Jackson Atlanta International Airport in Atlanta, both 2.5 hours from campus. Amtrak has a station in Clemson. The Crescent Route travels through Clemson with stops connecting New Orleans and New York City. Need a shuttle from the airport or train? Call Airport Shuttle of Clemson, Anderson-Clemson Shuttle Services or Larry Andrews Airport Services. Around Campus: Parking is metered and limited. The best way to get around campus (and the surrounding area) is by riding the Clemson Area Transit bus. Free, the CAT bus has several on-campus as well as downtown routes. Stay: Ask most alum, and they will steer you towards the James F. Martin Inn, centrally located about a mile from downtown and on the edge of the University’s campus, overlooking Hartwell Lake and next to the Walker Golf Course. They say you can hear the Tillman Bells from the brand new Abernathy, just across the road from the football stadium, super convenient on game days. Parents also recommend the Hampton Inn and the Clemson Courtyard by Marriott. Coffee: Join the students getting their morning fix at one of the two Starbucks on campus, either on the 5th floor of Cooper Library or in Building B of Core Campus. (Core campus is a significant new addition to campus life, a 260,000 square foot mixed-use facility that includes student housing, retail, and residential dining.) In town, everyone’s favorite coffee shop is All In Coffee Shop, also serving baked goods and light fare. Lunch: Students swear The Pot Belly Deli serves the best sandwiches in the city and is a popular gathering place for locals and students alike. One parent told us: "We ate at Palmetto's Smokehouse and Oyster Bar and really liked it. We also enjoyed 356 Sushi and BGR the Burger Joint during our visit." If you’re in town Thursday-Saturday a restaurant not to miss is the Smokin’ Pig for the best BBQ around. Traditions: You can’t visit Clemson without at least a pit stop at the Esso Club, celebrating 83 years as one of the top sports bars in the country and a big part of the university’s history. Especially popular on game days, students and faculty rave about their meat and three specials and often enjoy a mid-week lunch on the patio. Casual: For a quick bite, perfect after a long day touring, head to Brioso Fresh Pasta, you order at the counter, but then it’s all waitress service from there. The baby back ribs are a must try dish at Sardi’s Den, a favorite amongst Clemson students. Just a short drive in nearby Pendleton 1826 On The Green is a casual, eclectic bistro located in Farmer’s Hall, a beautiful building dating back to 1826. A Step Up: Students love to book a table at Blue Heron when their parents are visiting, serving an eclectic mix of seafood, steaks and the best sushi in town. Rustic steakhouse, Pixie & Bill’s is regarded as one of city’s original fine-dining establishments known for its lobster bisque and prime rib, but save room for their ‘famous’ ice cream filled crepes. Calhoun Corners is another popular local restaurant with a colorful history. Built in 1893 as a community civic center, later incarnations included a church and a general store, before opening as a restaurant in 1979. Go early to have a pre-dinner drink in their lovely courtyard garden, shaded by one of South Carolina’s oldest oak trees. Adding new blood to the restaurant scene, Rick Erwin’s Clemson serves traditional American fare in chic surroundings in Clemson’s Patrick Square. Sweet Tooth: Located just outside the Clemson University campus, lovers of ice cream congregate at Spill The Beans of Clemson, which leads a double life as a coffee house as well. Stop by, and you’re sure to see students studying while enjoying a hot Clemson mocha. Gear Up: Don’t leave Clemson without a stop at Judge Keller’s store, a Clemson institution for over 70 years. They have plenty of school apparel, and die-hard fans can order overalls in bright orange. Also on College Avenue, Tigertown Graphics has everything to satisfy a Tiger fan. Clemson has many traditions that make college life enriching and engaging. On Fridays, students, and faculty often wear orange to show their pride for the Clemson Tigers teams, and if you’re walking around campus any day of the week, keep your eyes open for the names of seniors engraved in the sidewalks. Remember once you are a Tiger your blood always runs orange! Just toured the Clemson Campus? Are you a Clemson student, parent or Alumni? Fill out this 2 minute survey to supplement our Daytripper University Guide for Clemson!